The finest infantry unit in the Swedish Army the grenadiers of Karl XIIs Lifeguard regiment. The will obviously have Guardstatus and be classed as All musket for Beneath the Lily Banners. 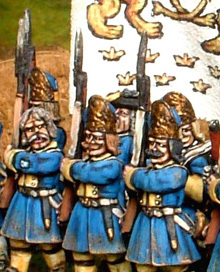 There may be some debate about the accuracy of the uniforms on these early Foundry models but they look great and are one of my all time favourite units.